Every child’s favorite part of school is recess, and we have the best commercial playground equipment for your school to make recess fun and safe for your students. When selecting playground equipment for an elementary school it is vitally important that the equipment be commercial grade and age appropriate. Elementary age children are notoriously hard on playground equipment. Because of this, we recommend using our 4.5″ and 5″ upright post playground systems for your elementary school playground. We have worked with several schools all over the county to create the perfect outdoor playground and our experts will help you do the same for your school! Click here to learn more. Many charities work directly with children and families. We have worked with several charitable and community organizations to create wonderful and safe places for children to play and develop using our expertise and high quality commercial playground equipment. With most of the charities we have worked with, quality and budget are of the highest concern as funds are normally limited and needed to serve the core functions of the charity. Knowing this, our experts always try to create playgrounds for charitable organizations that provide the most play activities at the lowest cost. We also encourage using a commercial playground unit that is designed for children ages 2-12 years old so you are able to accommodate children of all ages with a single commercial playground unit. Daycare and childcare facilities are serious business and over the last several years the industry has grown and become very competitive. Parents expect the best for their children not only in care and education but also in recreational and play activities. In addition to this most childcare and daycare facilities must meet requirements issued by the state for playground equipment. Our experts will create the perfect playground for your childcare or daycare center. We will design the playground to be durable and low maintenance. Having worked with daycare and childcare facilities all of the country designing and installing playgrounds our experts will make sure your daycare facility has the right playground equipment to make it both competitive in the marketplace and compliant with regulations. Click here to learn more. Most of our government and municipal clients have only two concerns in mind when it comes to commercial playground equipment and that is quality and price. “You get what you pay for” is a truth when it comes to commercial playground equipment for municipal and government spaces. Often quality is compromised in an effort to reduce costs. At Pro Playgrounds we understand how important our government and municipal clients are so we offer the lowest pricing in an effort to improve our communities and parks through play. All of our playground equipment for municipal spaces and parks is of the highest quality and commercial grade. We work with City, State and Federal organizations as well as Parks and Rec departments to create wonderful playgrounds, parks and outdoor spaces. Clients are demanding more now in the form of amenities when it comes to communities. For a busy mother with two children having a playground close by in the community may be the deciding factor when purchasing or leasing. The question is not whether you can afford a commercial playground for your apartment complex or housing community, but can you afford not to have one? We know what consumers want when it comes to playground for apartment complexes, condos and other communities and we will make sure that your playground is appropriate for your community based on the demographics you provide. We have designed and installed playgrounds for dozens of apartment complexes, home owners associations and housing developments. Click here to learn more. 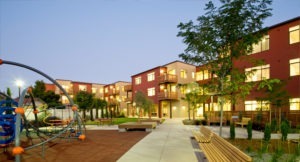 Creating a community atmosphere and providing amenities for residents is key to the success of many neighborhoods. Providing safe and accessible children playground equipment is a great way to attract new residents and keep your community safe. In addition, the installation of neighborhood playgrounds has been shown to improve the health of visiting youth and adult chaperones, as it increases both physical activity and social interaction. We have designed and installed hundreds of children’s playground equipment units for a variety of neighborhoods and communities across the United States. We understand your needs and your customers. Give us a call today. We would love to learn more about your community. Click here to learn more.